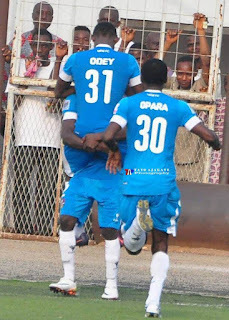 Mountain of Fire and Miracles Ministries Football Club prolific striker, Stephen Odey has dedicated January 2017 League Bloggers Awards (LBA) for the best player in the Nigeria Professional Football League (NPFL) to his coaches and teammates. The award-winning 19-year-old forward who was absolutely impressive for MFM FC in the month of January scoring four goals from four Nigerian top league games beat off competition from his teammate Olatunbosun Sikiru, Kabiru Umar of Plateau United and Olufemi Thomas of Rivers United to win the Player of the month award. Responding to questions from his team's media crew on Wednesday morning , the excited player appreciated the LB organisers for rewarding him with the award as he dedicated the award to his coaches and teammates. He said: "First and foremost I will like to appreciate the League Bloggers Awards organizers for recognizing and rewarding me with the award of the best player in the NPFL for the month of January. "It's such a wonderful thing to me, the award means a lot to me. "A lot of people contributed to it, the coaching crew led by Fidelis Ilechukwu and my teammates they made it possible for me. So I'm dedicating the award to them. Without them there will be no me. "And one love to my fans out there for believing in me and for supporting me in every areas of my career. I'm dedicating the award to them also," he told the club's website, mountaintopfc.com. Odey is currently leading the NPFL scorer chat with five goals from seven league matches. He netted nine goals in his first season in the Nigerian top league last year as an 18-year-old player.